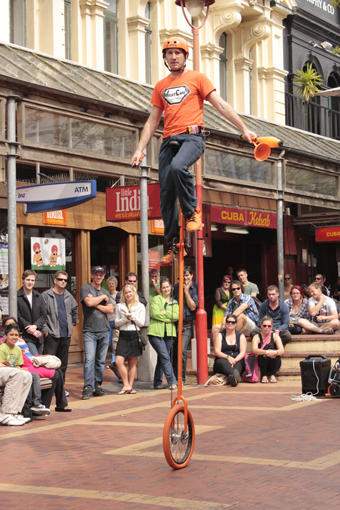 Is Cuba St our version of La Ramblas? The other day when I spied the goblin street artist below, I wondered if Cuba Mall could become another La Ramblas in Barcelona? La Ramblas is the most famous street in that culturally vibrant city. 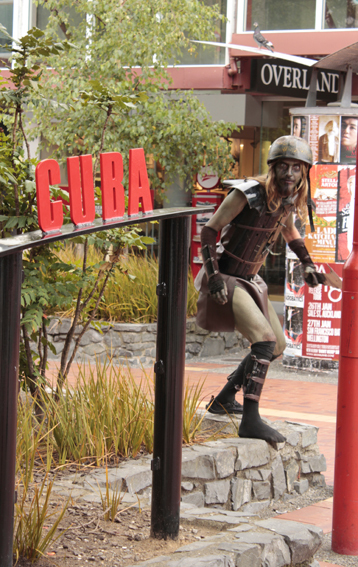 Is Cuba St and its culture part of the reason Wellington’s tourist numbers are growing? 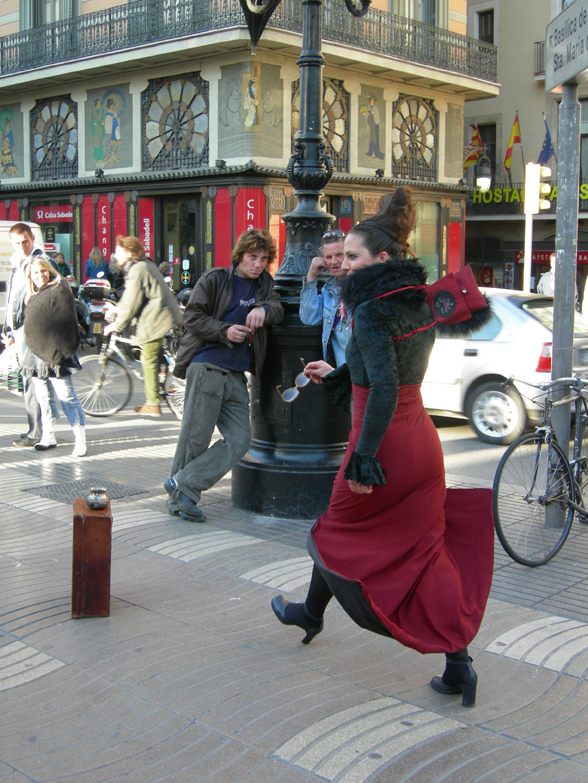 La Ramblas draws its visitors in because of the variety of street activities. 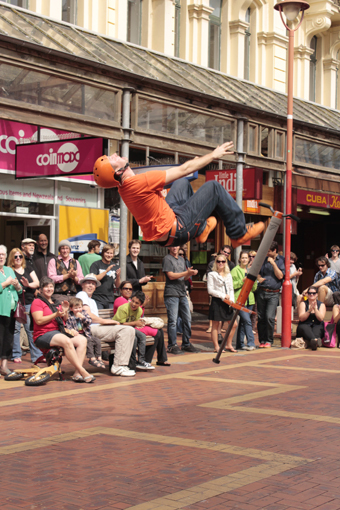 the partially closed street is an area for people to promenade and view the street artists. Performers are often frozen like Statue’s occasionally moving or performing surprise actions, the audience who are snapping photos incessantly are happy to throw a few euros into the buskers cups. 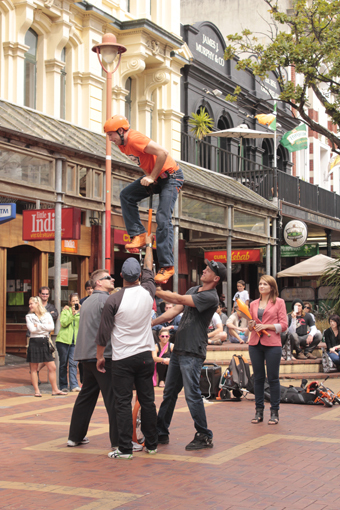 I am not sure how lucrative it is for our buskers but I reckon there is probably room for more street performers during our cities big events. The other reason people flock to Barcelona is because of its architectural heritage, Gaudi being the main one, Spanish tapas and good Sangrias another. 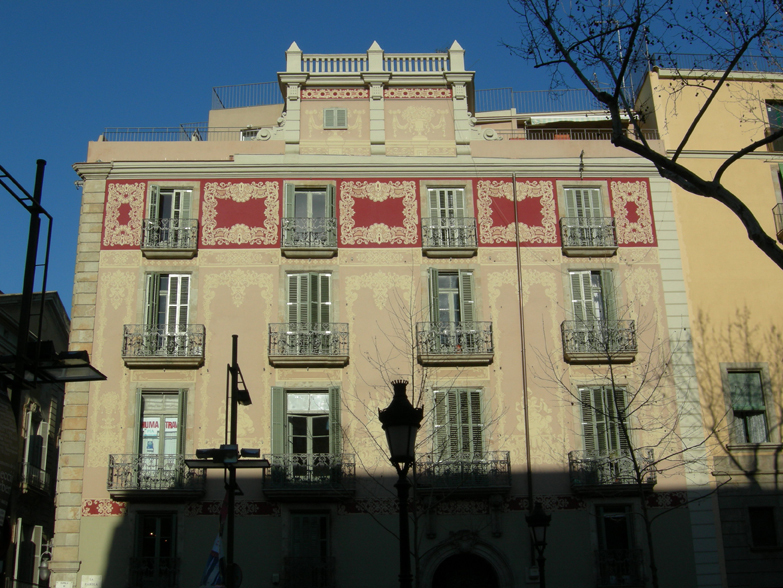 Between the wonderful buildings, the alfresco dinning and spectacle of the artists, La Ramblas has a huge amount on offer. Cuba St certainly has a number of architectural beauties from different eras and the cuisine chooses are endless from top end to cheap as chips. Having some street food could be an added bonus. The coffee is some of the best in the world and wine options are award-winning. Cuba Mall is already a place locals and those in the know visit while in town and our tourism office and accommodation providers are hopefully encouraging visitors to wander its length. The St has always got some creative characters worth watching and the numbers of alfresco options are increasing within the mall’s environs. It’s good to see this street culture is being encouraged with the city councils policy on allowing free busking licences and more recently allowing eateries to spread themselves out into the Mall. Let’s hope that the streets cultural importance as part of the city’s profile is not forgotten in the next decade or more. The earthquake prone buildings problem has the ability to destroy this wonderful cultural precinct. Will the mall still have the same feel when a large number of the character buildings have been demolished by their owners because they can’t afford to strengthen them? What will the future look like? I really think we need to be having a conversation about this issue. currently it is possible to engage with the council on their long term planning. I think you need to get in within the next 2 weeks before they start to vote on it etc. 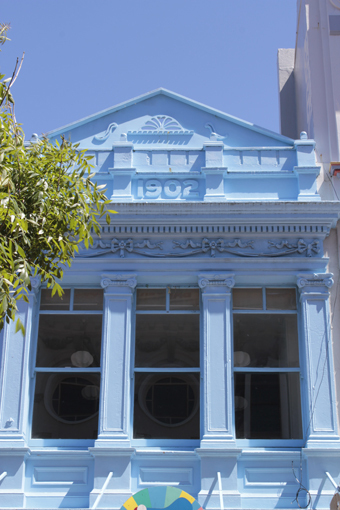 We are spoilt for choice when it comes to finding great food or drink in Cuba St. 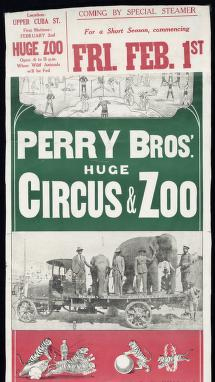 There has always been a variety of places to choose from, starting 172 years ago. According to the history books there where oyster bars in the street in the 1800’s, fresh oysters dredged from our harbour. Imagine if our forebears had considered sustainable fishing management back then. I was lucky enough recently to be wined and dined by my husband to celebrate our 29 years of marriage. Logan Brown was our venue of choice where we feasted on the smaller of the two Degustation menus. Wow what an experience, even though it was the smaller menu it was more than sufficient to satisfy us. The fantastic food and wine combinations inspired foodie conversations amongst us and with our waitress. The Wild Hare Tenderloin with Smoked Beetroot Risotto, Black Pudding & Goat Mascarpone was an absolute favourite. The restaurant is located inside the splendid National Bank building constructed in 1917 and of Greek Temple Style, with Corinthian Columns inside and out. The interior a two-story high octagonal hall, is a joy to sit in. This wonderful building is listed by the Historic places Trust as category 1. Thankfully this is not one of the streets many historic buildings on the prone to earthquakes list. The restaurant can’t be seen from the street and if you want to enjoy all its beauty and the great food you need to be prepared to spend a week’s rent on the experience. I suspect the clientele who frequent Logan Brown would more than likely be occasional visitor’s to Cuba St and imagine they mostly work at the other end of town, where the salaries allow for such choices. 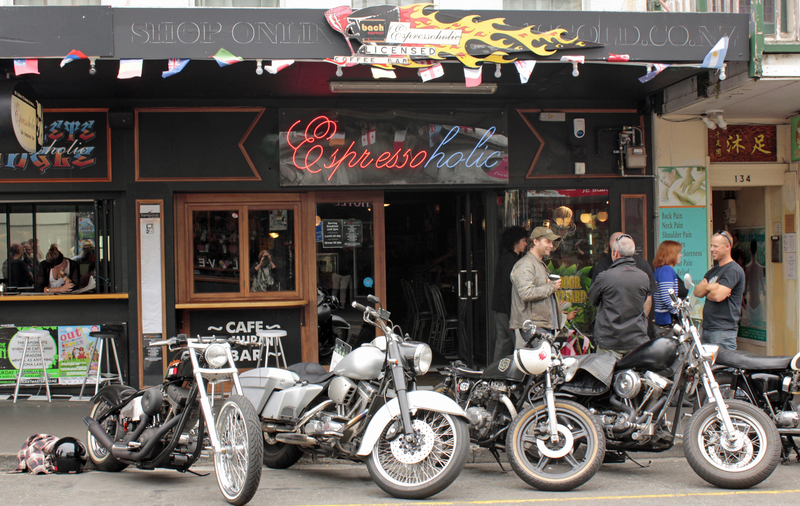 At the other end of the spectrum, somewhere where anyone is welcome and can afford and enjoy good food and coffee is Espressoholic. Further down Cuba St it’s a great place to sit over what must be the most affordable good coffee in town, at $3.50 a cup it’s sustainably brewed from free trade organic beans. Leighton and Majida have recently extended the café with plenty of options for you to sit inside, outside or between the two, the new veranda area looks straight onto the street, a wonderful people watching spot. 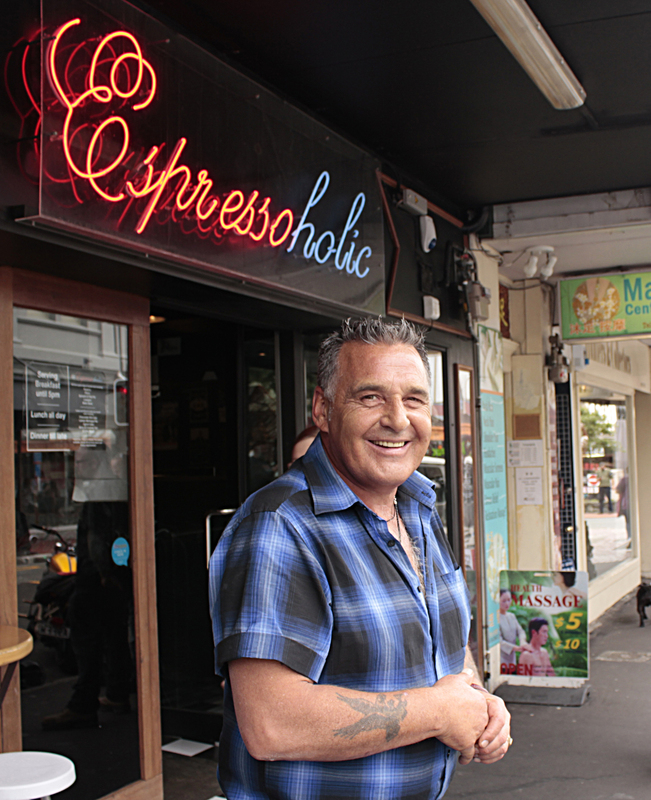 They have owned Espressoholic in Wellington for 18 years and been in Cuba St for the last 3 years. Leighton feels being at the grunge end of town is Espressoholics natural home. The cafés Theme is ‘Love in the Concrete Jungel” and there are wonderful murals painted on the walls by artist Dave Cleary. This is one eatery on the street where a variety of visitors and residents of Cuba St dwell and this building is also not on the prone to quakes list, another safe place to hang out in the street. I have decided to make it part of my research to experience every eatery in the street. 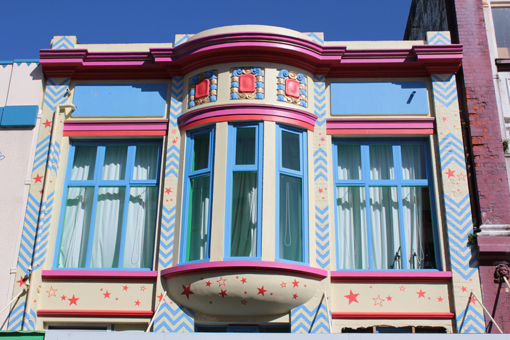 Food is one of my passions as is architecture and Cuba St brings all of them together. I don’t think I will need to leave the street for some time to find a good place to eat out. 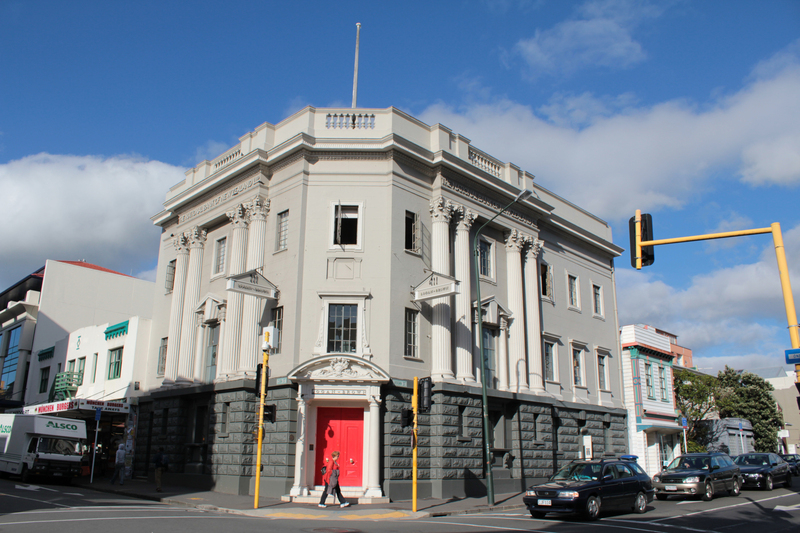 I am not sure if you have noticed but there are two red stickered buildings in Cuba St.
On reading them they are both slightly different. 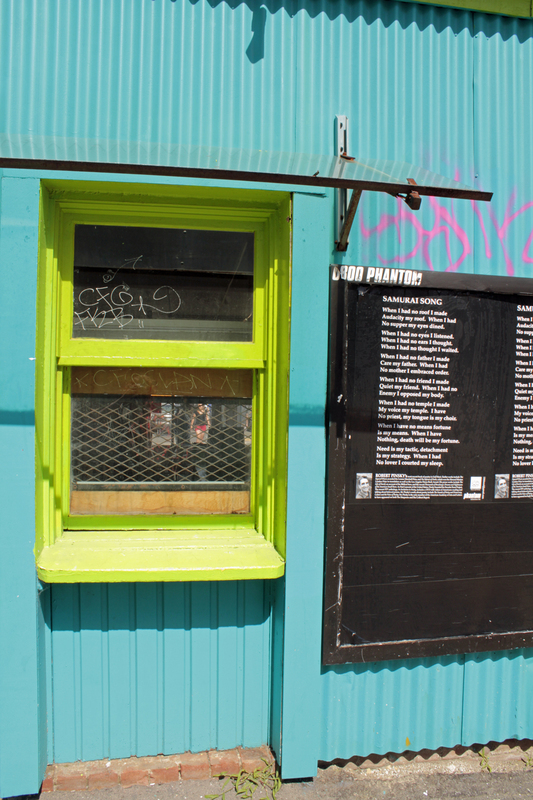 The first one appeared late last year on the single story ex drycleaners on the intersection of Cuba & Abel Smith St’s. It proclaims that people are in danger while walking past it. Well heaps of people walk past it totally unaware that the council deems it unsafe to do so. I can’t help but wonder why there is no barrier by it, or is it just bureaucratic fussing. It is a single story partial concrete and wooden constructed building. I would not have thought it to be the most dangerous building in the street prone to collapse in a large quake. 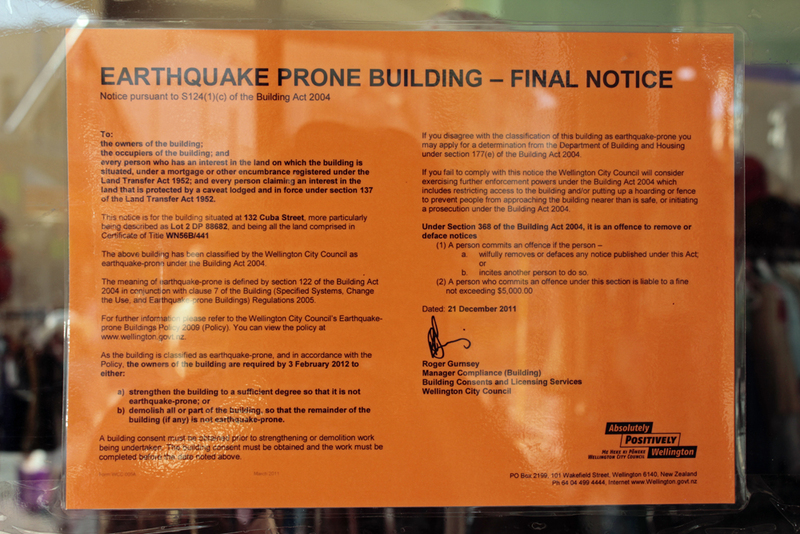 The notice states that the owner is required to demolish or strengthen the building and this will require consent from the council one way or other. The second red sticker currently displayed in the street is on the old Ernesto building the original Hallentien Brothers factory on the corner of Ghuznee and Cuba. 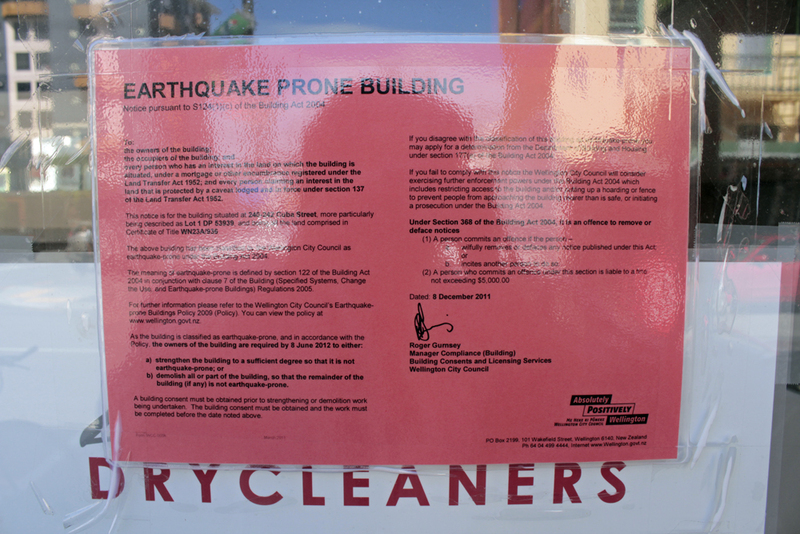 This red sticker has mostly the same information on it, except that it has a date February 2012 as being a deadline for the owner to either demolish or strengthen the building by. Since my original post I have heard from a neighbouring business owner that the owner has been given a 3 month extension by the council. A temporary shop sprung up just before Christmas in this building. 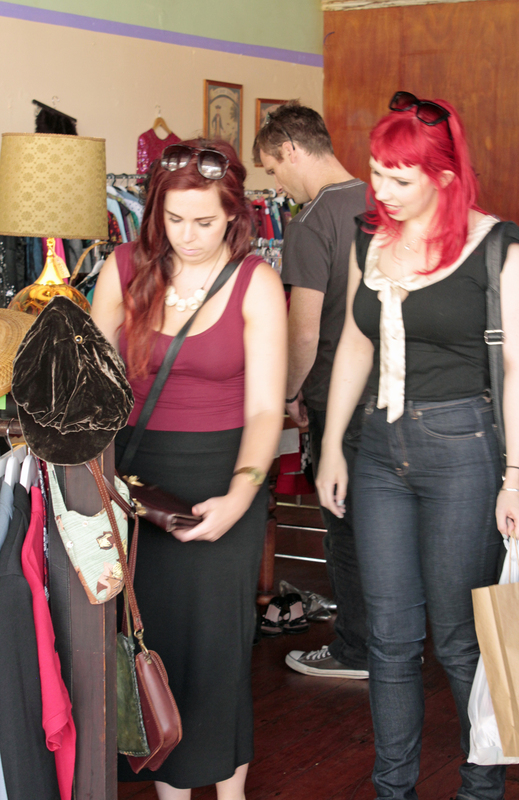 Another second hand clothes and goods outlet run by a collective of young ones. Plenty of interesting characters can be seen rummaging in the weekends here. Anyway not sure how many are reading the sticker, but it does inform you that you are in danger while searching out that new retro outfit. One of the collective in this shop tells me that it is safe for shoppers otherwise the council would not let them be there, interesting that stand from the council considering the submissions and questioning currently taking place at the royal Commission in CHCH. I have heard through the Bristol grapevine that the owner of the aforementioned building is taking on the council and pushing them to the limit on their red sticker threat of action. There is talk that the building next door is leaning on it and would collapse if this one was demolished. Apparently the landlord has the financial ability to strengthen it but does not want to, that is one piece of gossip. Two other people have said that the owner does not have the finances required. 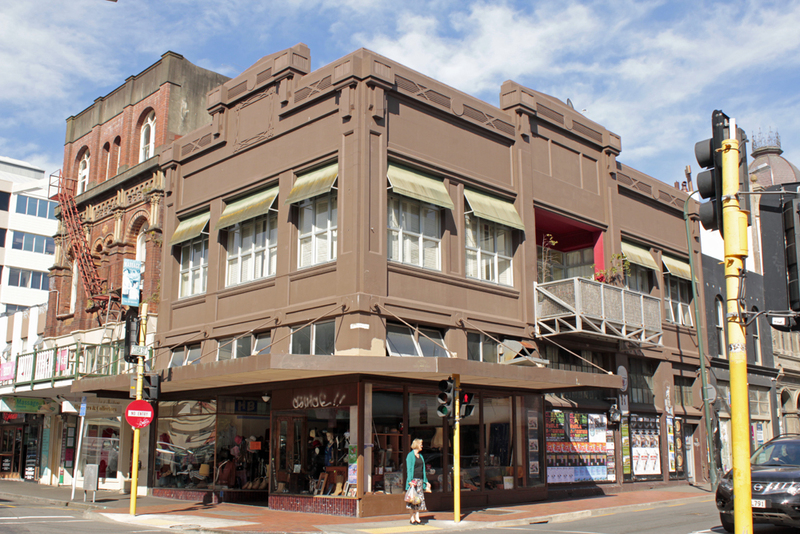 I have just learnt that the building has a heritage listing attached to the front windows that I love. Apparently the missing lead light’s where blown out in high winds and are being kept in a safe place awaiting restoration. It will be interesting to see how the council and landlord proceed with this situation. Meantime if the ground starts to shake while I’m in Cuba St I shall make a b line for? Well I am not sure really. According to the royal commission on the Christchurch quakes, buildings of similar age too many in Cuba St and strengthened in the last 20 years partially collapsed anyway. Falling masonry and veranda collapses being a big risk. So how will our council move forward on this matter? And are Cuba St residents and visitors concerned about probability verses the now of enjoying the atmosphere and uniqueness of Cuba St.
Is this woman responsible if one of her customers is hurt while in her shop? Are these woman aware or intrested in the dangers while they shop? Single story; is it really a danger?